Oh summer, where are you? It’s depressing wearing all those dingy dark colours all the time, and all my pretty pastel dresses just don’t look right covered with a cardigan. 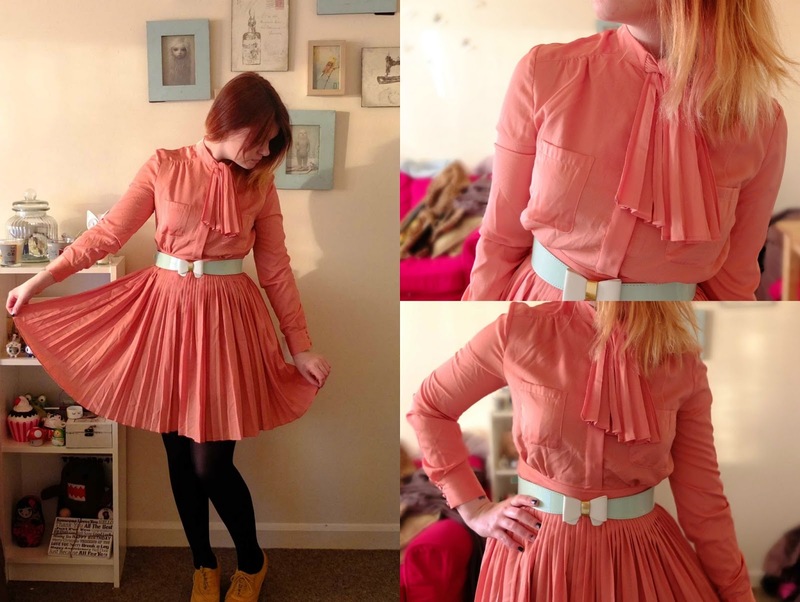 But alas, I dropped upon the perfect compromise for this today in TK Maxx, in the form of this super pretty peach Monsoon Fusion dress. The long sleeves make it a very nice number to wear on days when it’s still got a chill in the air, but it’s a nice light colour so still bringing a touch of sunshine to my life…. And for £14.99 it also didn’t stab my bank balance in the eye too much either. I’ve been a big fan of the Monsoon Fusion range for a while now, it’s got so many quirky cute garments in it, but with dresses like this one often weighing it at around the £50 mark I’ve not been able to invest! 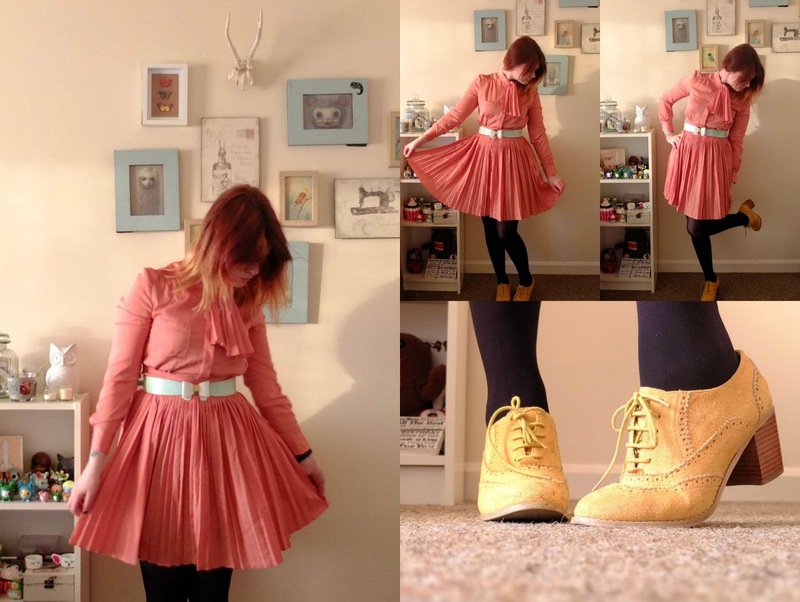 Teamed with some of my finest Primark goodies, such as this cute baby blue bow belt and these amazing mustard yellow suede brogues, I kind of love this outfit a little bit too much. I’ve been finding it hard to wear this belt because it’s a bit of an awkward size/shape/colour to match with other things, but with this I feel it works a treat. One thing I’m not sure about with this dress is the ruffled collar thing. It’s really cute, but not long enough to fashion into a bow, and I’m not sure how it’s meant to be tied. It’s pretty enough as it is though I guess. The belt cost something like £2.50 and I remember being very pleased with these shoes last year when I caught them in the sale for like 4 quid. It does look like the weather is picking up a little now though, which is never a bad thing eh! Well, in Stoke on Trent it is. I’ve seen a lot of people on Twitter going on about snow today, but alas we have missed it FOR ONCE here up north. This week has totally thrown me out of sync too and I’ve completely screwed up my schedule by not even realising the date. A bit gutted to missing out of the #northmeetup in Manchester this weekend because of my dopeyness. If you go along let me know (so I can be really jealous).